Prosthechea cochleata, commonly referred to as the Cockleshell Orchid or Clamshell Orchid, is an epiphytic, sympodial New World orchid native to Central America, the West Indies, Colombia, Venezuela, and southern Florida. The flowers are unusual in that though the labellum is usually below the column in the orchids, in the members of Prosthechea the labellum forms a “hood” over the column. This makes the flower effectively upside down, or non-resupinate. Prosthechea cochleata is common in cultivation, and is valued for its uniquely shaped and long-lasting flowers on continually growing racemes. 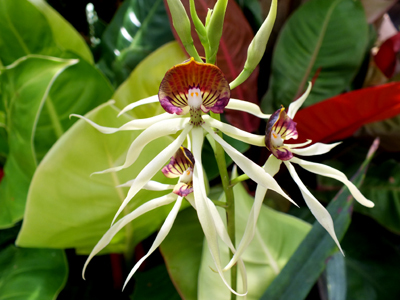 Prosthechea cochleata is the national flower of Belize, where it is known as the Black Orchid.